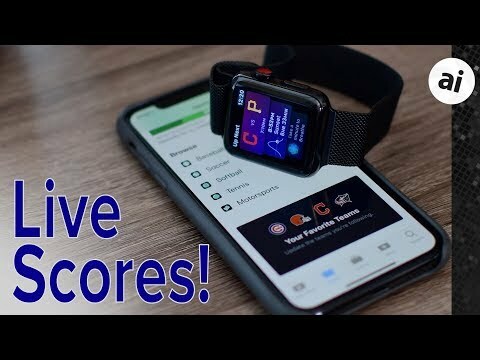 Sports fans can now view live sports scores of favorite teams, right from the Siri watch face on Apple Watch in watchOS 5. AppleInsider dives in to see what it can do, and how it works. For ages, Siri has been able to tell users the live scores of sports games, pulling in data from Yahoo along the way. Apple has continued to bolster this ability, even adding many new sports categories, such as motorsports in iOS 12 and watchOS 5. One of our favorite features of those updates has to be the ability to view these scores live on the Apple Watch, with no user intervention required. Powered by Machine Learning, the Siri watch face learns over time things that you care about most, and presents them to you. This watch face gained a few notable improvements this year, including adding data for live sports. Any of your favorite teams will now appear front and center in the Siri watch face, live updating as the game progresses. Tapping into any of these cards takes you to the Siri interface, where she will summarize the current state of the game, and provide additional information. As the Siri watch face is able to scrub through time, when looking into the future, you can also see any upcoming games, who the opponents are, and what time the game starts. When viewing these cards, Siri will provide you with the current upcoming schedule for the tame you tapped on. Getting started, an Apple Watch running watchOS 5 and an iPhone with iOS 12 is required. The Siri watch face needs set on the Apple Watch, and we will be using both the Apple Watch app and the TV app on our iPhone. Under MY FACES find the Siri watch face that is currently active on your Apple Watch. Scroll down the page to the Sports section below Data Sources. Make sure this is toggled on, and highlighted in green. Open the TV app on your iPhone, and go to the Sports tab. Scroll to the bottom of the page, and choose your favorite teams. Admittedly, this can be a bit fiddly in the beta period, with scores sometimes showing up late, or not disappearing until the next day. It can also be difficult to tell when your changes are locked in, as nothing will appear until the next scheduled game. We've been rocking watchOS 5 and iOS 12 since Apple's dev conference, and this feature has come in handy repeatedly for when we want to tune in to a game, but aren't able to actually watch live. Learn how else Siri has gotten supercharged here in watchOS 5! Why does this look like another article screaming for clicks yet somehow forgetting that countries outside of America actually exist? You can add your favorite soccer teams from English, Spain etc. Are you saying that AI should only write about features that are available world wide? If so, that just seems silly. This is one of those features that I think is cool but likely won’t use, mostly because I don’t follow sports much. It’s slightly disappointing, in a way. I've taken great pains in the past to avoid sports score notifications (generally from news sites). I care about the sport and but couldn't watch the game live - so don't want the score spoiled before i see the game. I care about the sport and have seen the game - so don't need the score. I don't care about the sport and don't care about the score. So, if Siri work's out which sports I like and starts spoiling them, this setting will be disabled pronto. I just don’t understand this. If you like, for example, soccer, there are too many great teams out there that you couldn’t simply follow them all. It’s a great feature to follow other teams around and be very up to date.